Interactions/Mosaic, 6th edition prepares students for college life through intensive skill development, extensive vocabulary work, and modern content. Connect ESL is an online environment custom designed for teacher needs. With all-new, automatically graded exercises for every chapter of Interactions and a full e-book. Connect ESL is an online system for homework. 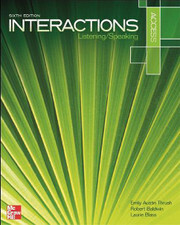 It also has an e-book version of your Interactions textbook.